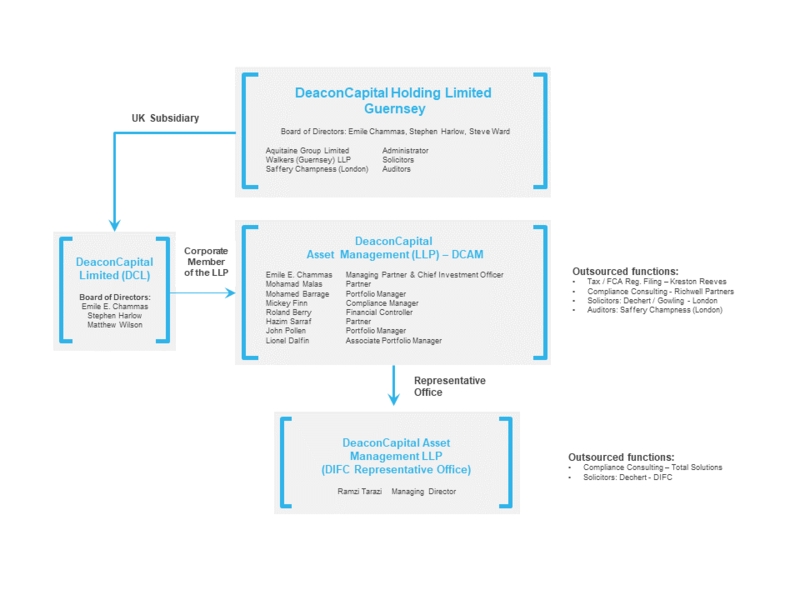 DeaconCapital Group (DCG) presence in Dubai International Financial Centre (DIFC) dates back to March 2009 initially via DeaconCapital (Dubai) Limited – DCD, and then from January 2016 via a Representative Office (RO) for DeaconCapital Asset Management LLP (DCAM), the UK FCA regulated entity. DCAM (DIFC RO) operates under the Dubai Financial Services Authority (DFSA) Representative Office Regime. DCAM (DIFC RO) spearheads the Group marketing and business development efforts regionally covering all the services offered by DCAM and within the scope of its approved services by the DFSA, the RO coordinates closely and supports the DCAM teams that cover each of the four Services. DeaconCapital Group takes its corporate governance responsibility very seriously and has in place appropriate systems and controls that support transparency and accountability. Such systems and controls include but are not limited to organizational charts and clear reporting lines, the timely provision of regulatory filings, financial controls (including budgets and management information), periodic reviews of business strategy, supervisory Board meetings, the maintenance of all required records and other business policies and procedures. DCAM maintain a robust compliance framework that observes the continuously changing and evolving regulatory environment. DCHL in Guernsey, as the Group holding company.